Are you planning a trip to the spa, but aren't sure what to pack? A few luxury spas like Golden Door and Cal-A-Vie supply guests with freshly laundered workout clothing every day, but even so, you'll probably look better in your own wardrobe. So here's a complete packing list—and some extra things to consider—for your trip to to the spa. Workout clothes for fitness classes, yoga classes, and hikes. Depending on the season and climate, include short and long-sleeved t-shirts, comfortable workout plant and tops, a fleece vest, warm-up clothes, a windbreaker, a good sports bra, and yoga clothes. Layered clothing is highly recommended for early morning hikes and days that start out chilly and warm up. Aerobic, walking, running, or cross-training shoes for most fitness classes and private gym time. Fitness classes usually include cardio, circuit training, and dance. Swimsuit, swim goggles, pool shoes. Water aerobic classes, floating meditation, and downtime by the pool are some of the aquatic possibilities. Many spas have swim coaches who can help you perfect your style. A dress, sweater, or other dressier clothes for evenings if you want a little glamour, especially at resort spas. 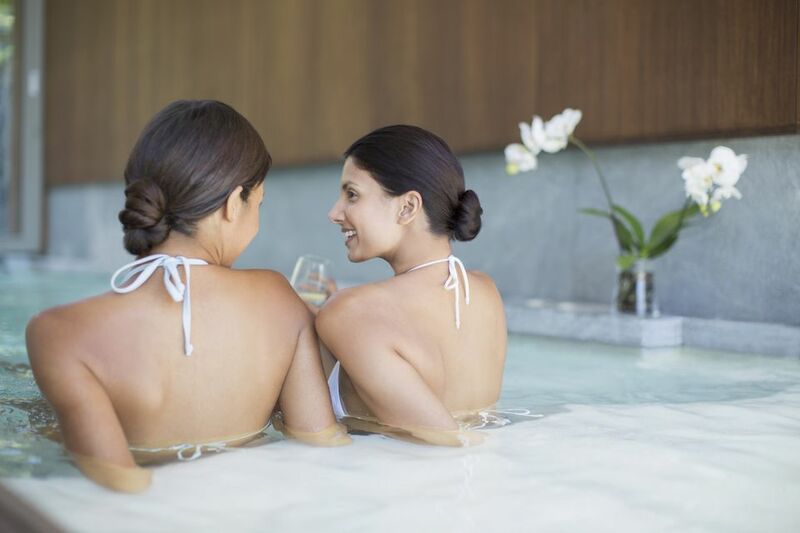 At destination spas where the focus is on health and wellness, you might wear casual clothing to dinner. Rancho La Puerta evenings have a dressier, more celebratory feel, while Golden Door supplies a signature blue and white Japanese Yukata (cotton robe) for guests to wear to dinner. It helps to find out the custom at the spa you choose. Favorite casual basics like jeans, T-shirts, and sandals when you change out of your workout clothes. Sunscreen for both face and body, a sun hat and sunglasses. You'll be spending a lot of time outside in a sunny place, so come prepared to protect your skin and eyes from sun damage. Broken-in hiking boots or shoes with a lugged tread. Walking or running shoes are just fine for easy strolls, but if you're going to a spa that offering advanced hikes on rough mountain trails, bring hiking boots with ankle support. Break them in before you go, so you don't get blisters. Heavy boots or shoes are also recommended for encounters with horses. Several pairs of light wool or synthetic hiking socks and liners. Avoid cotton socks because they cause blisters. Small lightweight daypack or fanny pack to carry a water bottle and snack on hikes. Hydration pack for serious hikers who plan to be out for hours and go at a fast pace. With a Camelbak or other hydration pack, you can carry anywhere from 30 to 150 ounces of water on your back and not have to stop to unscrew a bottle. Golf clubs. Lots of resort spas have great golfing. Tennis rackets. Most spas have good tennis courts. Binoculars, if you like to go birdwatching. Padded bike shorts for spas with biking programs, like Red Mountain Resort in Ivins, Utah. A good camera to capture the beauty you see. An inspiring book to read on the plane or before you go to sleep. A journal to write about your thoughts and experiences. Your favorite shampoo, conditioner, and body wash— or you can try what's in the room. Make-up, but only if you feel like it. Health and wellness spas are very casual, and the focus is on inner beauty. You don't need to bring a robe, however. There will be one in the room if it's a major resort or destination spa. If you forget something, just head for the spa gift shop, which should have a great collection of the latest yoga wear, workout clothing, swimsuits, casual clothing, beautiful jewelry, skin-care products, makeup, good books, and lots of interesting things you never knew you needed.